In a large pot, cover the potatoes with cold water and bring to a boil. Add a generous pinch of salt and simmer until tender, 15 to 20 minutes. Drain and let cool, then halve the potatoes. Light a grill and oil the grate. In a medium bowl, toss the potatoes with 1 tablespoon of the olive oil and 1/8 teaspoon of the paprika. Season with salt and pepper. Grill the potatoes, turning, until lightly charred, about 6 minutes. Transfer to a plate and let cool completely. Keep the grill on. Meanwhile, in a medium bowl, toss the carrots with the remaining 2 teaspoons of olive oil and 1/8 teaspoon of paprika. Season with salt and pepper. Grill the carrots, turning once, until tender and lightly charred, about 6 minutes. Transfer to a plate and let cool completely. 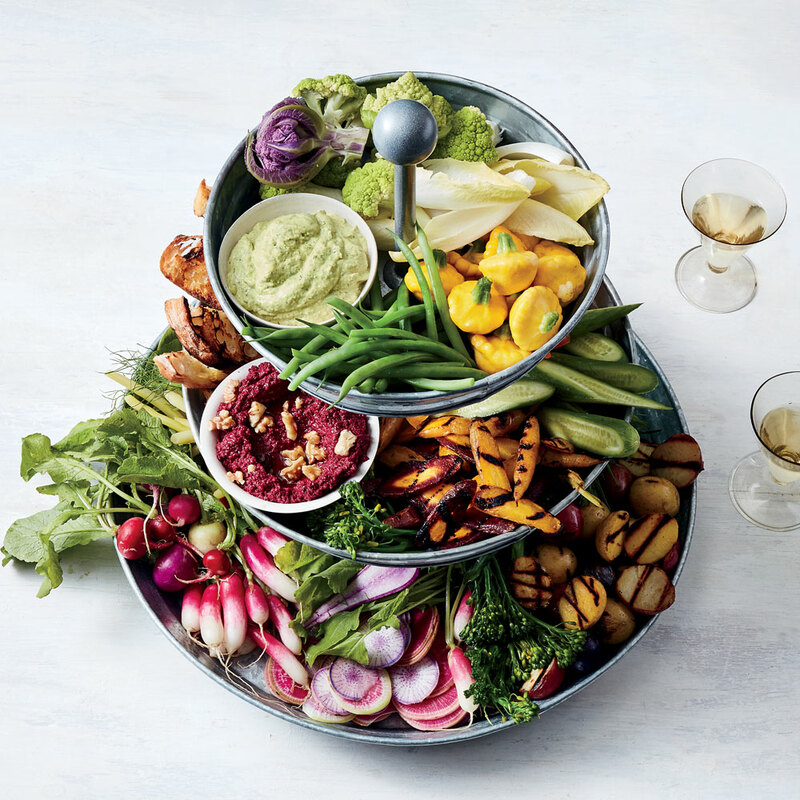 Set the muhammara and tahini on a large platter or tiered stand. Arrange the grilled bread and the blanched, grilled and raw vegetables in bunches around the dips. Garnish with edible flowers and herb sprigs, if desired; serve.